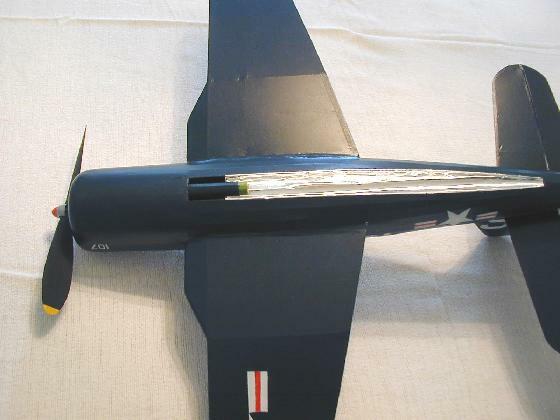 Here is a further selection of photos of Rapier powered scale models. Another Focke Wulf FW 226 Flitzer built from Richard Crossley's plan to check how well it flies before it is kitted by Aerographics. This one is by Chris Strachan, and features a really mean-looking reptilian scheme. As the real aircraft never flew, the choice of colour scheme is entirely down to the whim of the builder. I think this one is great! 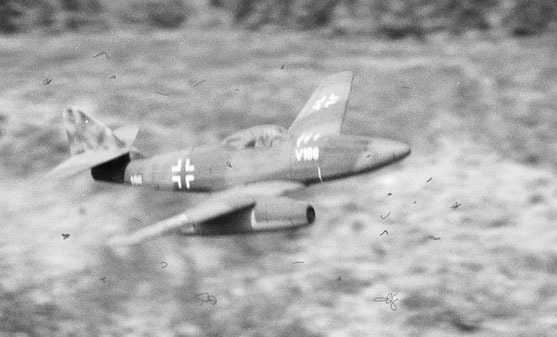 Genuine wartime photo of Me 262 V186 taking off on a test flight. OK, not really, but an imaginative treatment by Richard Crossley of a photo of his Rapier L2 powered replica. 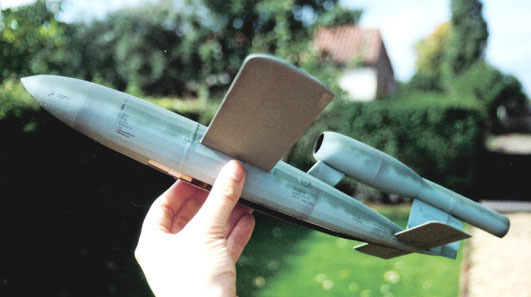 The plan was included inside the September/October 2001 issue of Flying Scale Models magazine. 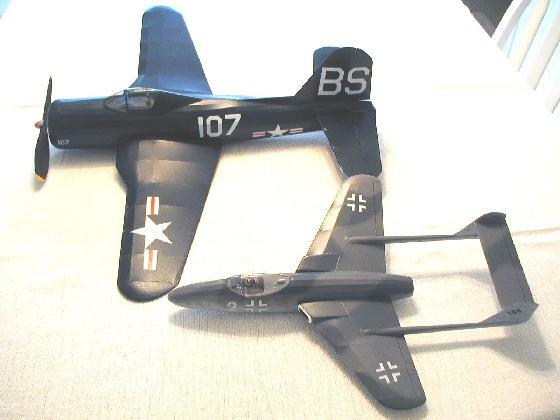 Here are two photos of Richard Crossley's Flitzer built from his own plans. It is a fine flier, just like the other two. The finish is immaculate, as always from Richard. 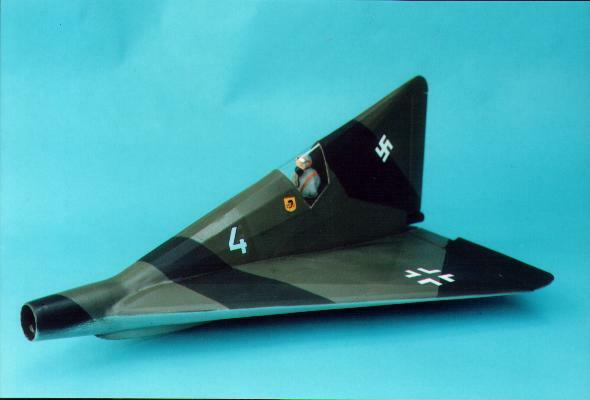 Chris Strachan's latest luftwaffe "might have been" project is this Rapier L2 powered Lippisch P13a. It is proving a real challenge to trim - Chris defines challenge as "not quite impossible yet"! Here are two shots of Richard Crossley's gorgeous Douglas Skystreak on its maiden outing - it flew "straight off the board" apparently. Power comes from a Rapier L2. Look out for the plan in a future edition of "Aeromodeller" magazine. Marty Richey hails from Indiana in the USA, and is one of a growing bunch of Rapier scale model enthusiasts over there, despite the difficulties getting hold of the motors. This very neat Ryan Fireball represents, to my knowledge, the first attempt to model a dual power aircraft using both Rapier and rubber power. Wingspan is roughly 25" and empty weight (with prop minus Rapier) is 65 grams. Weight with prop and full Rapier L2 is 71.7 grams. 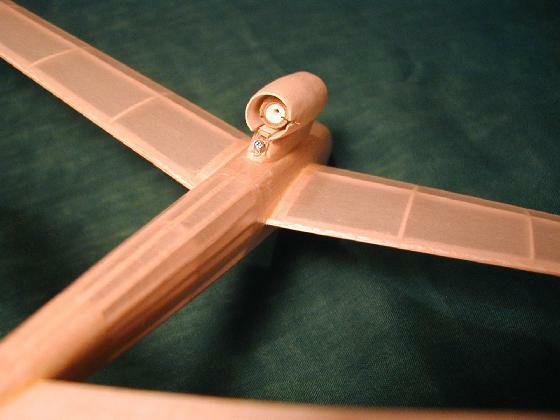 Gross takeoff weight will have to wait on final rubber motor selection. Rudder and elevator are hinged for trimming and the 8" prop and drive is Gizmo, for now. In the photo above you can see a size comparison with Marty's Flitzer, built from Richard Crossley's plan. 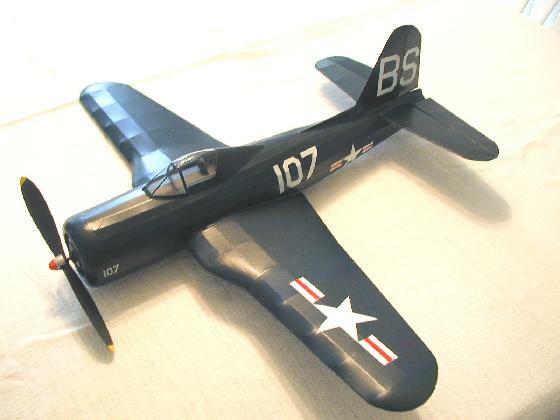 The model was inspired by a 1945 Ray's Models kit that used rubber/CO2. Provision has been made for Rapier L2 power, but there is room to move up to Rapier L3-4. 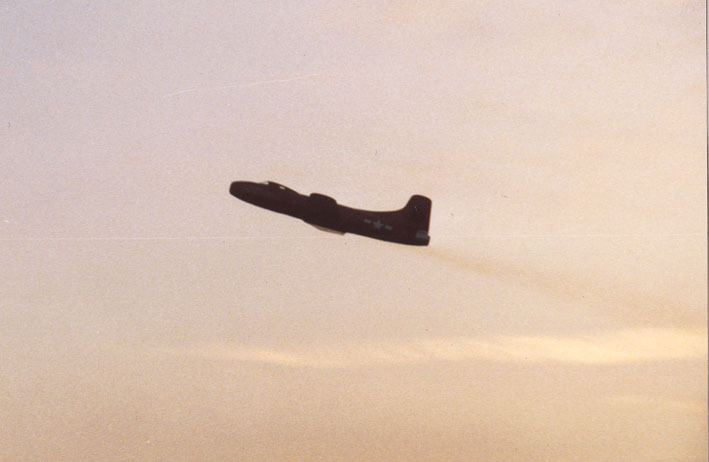 The kit's wing design was junked for a flat bottom conventional spar layout. The tailgroup was also replaced with a 1/8" material based layout. 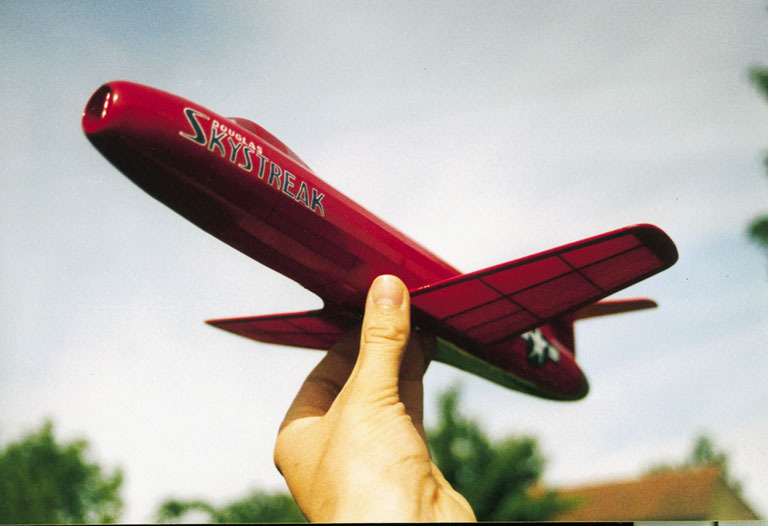 Marty intends to set this model up to fly Rapier and rubber from launch. In other words, neither motor provides adequate thrust alone for flight. Below you can see the motor trough and position of the Rapier mounting tube. Flight trials are awaited with keen interest! Here is a picture of another of Marty's models, a Fouga Cyclone built from the Veron kit plan and printwood, reduced to 87% full size. Test glides suggested the C/G was too far forward so a lot of balast weight was removed from the nose. She now weighs just 31.4 grams gross takeoff (with a full L2 Rapier), so performance should be very respectable. The motor mount (see photo below) is adjustable up/down and side to side. Marty always wanted a yellow model and the N number was taken from his '49 Bonanza, N526B. I think you'll agree that this is a very elegant and neatly finished model. 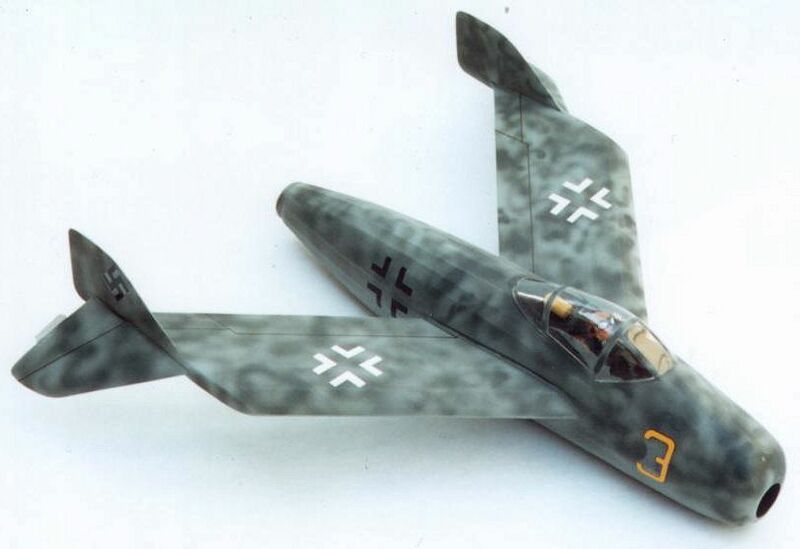 Chris Strachan does like oddball subjects, often without tails, so not surprising he fancied having a go at the Blohm und Voss BV 212 - another late war German project that never got off the drawing board. I have seen this in action, and can confirm that, unlikely as it may sound, this model actually flies - power is Rapier L2. Very nice airbrushed finish is of course completely hypothetical! 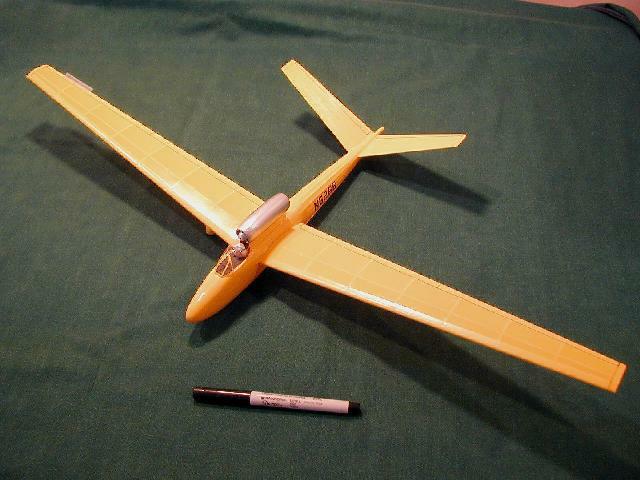 Here is a picture of Richard Crossley's Fiesler Fi 103. it flies well at 12" span with an L2, would be superb without the dummy motor going along for the ride!